Schooner Consulting and Management Services, Inc. is a certified minority owned business engaged in financial and organizational consulting. We provide consulting services to both small and Fortune 3000 companies locally, regionally, nationally and internationally. Our client group is comprised of suppliers to industries such as automotive, healthcare, information technology, oil & gas, insurance, educational institutions, construction and logistics. In many cases, our clients are national leaders in their industries. Our program for Minority and Women Owned Business Enterprises (M/WBEs) offers a full range of consulting services that provide clients with the necessary insight, expertise and decision-making tools that allow them to address the challenges they face in growing their business. Our work with large Corporate Clients, both private and public entities, provide creative solutions that compliment the diversity strategies of the company. 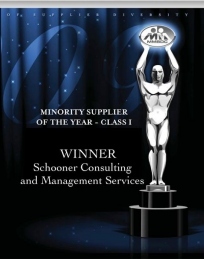 Schooner Consulting has the distinction of being selected as the 2009 Minority Supplier of the Year - Class I by the Michigan Minority Supplier Development Council, one of the most prestigious affiliate Councils in the 39 council network of the National Minority Supplier Development Council. This prestigious award recognizes Schooner Consulting for its distinguished work in consulting with corporations and certified minority business enterprises utilizing creative approaches to making diversity a part of their strategic plans for growth.